Role: Observing local professionals and performing routine tasks in various departments at hospitals, clinics, and community outreach programs. Requirements: None in most cases. Varies by project and destination. By signing up for one of our medical internships abroad in a developing country, you will gain invaluable preparation for a career in general medicine, dentistry, nursing, midwifery, public health, physiotherapy, occupational therapy, speech therapy, or nutrition. 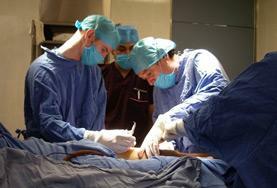 We have medical internships abroad to suit people of all levels of qualification and experience. On one of our medical internships abroad, you will receive the same unrivalled support from our staff in your home and destination countries. We will work with you to find an internship abroad that suits your level of experience. When you arrive at your destination, we will meet you at the airport and give you a comprehensive induction of your local area, including meeting your host family and getting you acquainted with where you will be living and working. Once you start work, we will meet regularly with you and your supervisor and are always available both inside and outside of normal working hours. 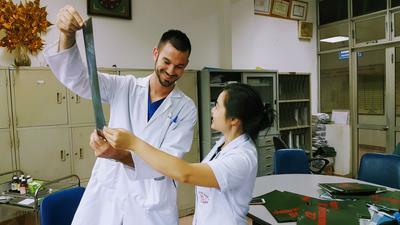 Students enrolled in medical school or other health sciences degree programs can choose to do an Elective abroad with Projects Abroad. We also offer Psychology Projects for students with an interest in the field. At all of our Medicine & Health Care Projects, we use a secure and anonymous database to track the medical work that we do throughout the developing world. The database allows staff and volunteers to gather data when we run medical outreaches or health awareness programs, create patient profiles so we can help and monitor individuals who see us regularly, analyze and report our results, and collect research data and publications related to health care issues. All of these factors will help us achieve the long-term goals set out in our Medicine & Health Care Management Plans. It will also help us improve the health care services we provide and better target the work we do on the ground around the world. For example, if we notice that there are high rates of HIV infections in a community, we can focus on running awareness programs that raise awareness of the disease and how it’s transmitted. For teen volunteers, Medicine & Healthcare Projects are available as Medicine & Healthcare High School Special programs. High School Specials are designed for volunteers aged 16-19 to join a group of their peers working together under the guidance of our local staff. If you are a professional and want to put your skills to use on a Medicine & Healthcare Project, Projects Abroad has placements for skilled and qualified volunteers. Our main focus is to match your skills with our partner organizations' needs. Please visit the Medicine & Healthcare Projects for Professionals section for more information. 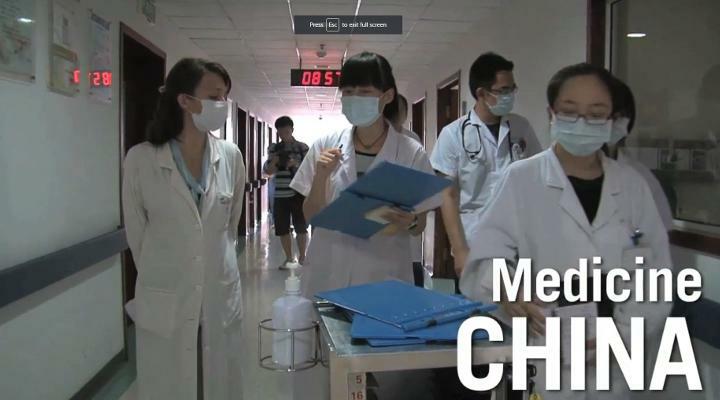 Interning abroad on a Medicine internship is an ideal way to gain work experience while often helping some of the neediest people and poorest resourced medical institutions. 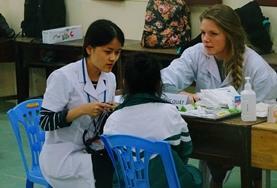 If you want to take up an internship abroad as a nurse, we have a huge number of different opportunities available. 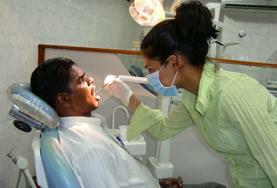 You will be able to shadow and observe qualified medical professionals. Midwifery interns observe local midwives and doctors and help provide pre-natal and post-natal care in hospitals and clinics. Interning abroad on one of our Dental placements is a fantastic way to gain practical experience in dentistry by working in hospitals, clinics, and community outreach programs. Occupational Therapy interns work alongside local occupational therapists or independently provide care for patients in rehabilitation centres and facilities for the disabled. Choose to intern abroad with us on a Physiotherapy internship and you will gain a great deal of work experience, as you provide support to our colleagues in the developing world. Projects Abroad offers internships in Speech Therapy to interns who have completed at least one year of studies in speech therapy. You will help local speech therapists treat patients in rehabilitation centres and facilities for the disabled. Interns who wish to specialize in the community outreach aspect of our Medicine & Healthcare programs can join a full time Public Health project. Work alongside professional pharmacists by observing and assisting in medical facilities and pharmacies. 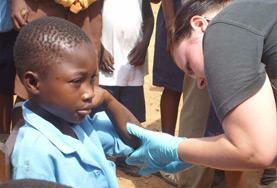 Interns will also go on outreach projects to provide basic medical services and medicine in outlying communities.